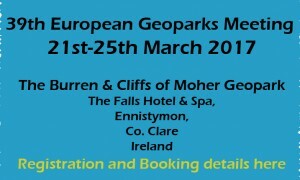 The Burren and Cliffs of Moher Geopark are set to host the 39th European Geoparks Meeting. The Meeting will see members from all 69 European Geoparks travelling to the Burren for a series of workshops, meetings and a fieldtrip. Established in June 2000 The European Geoparks Networks (EGN) main objective is the protection of geological heritage and the promotion of sustainable development of Geopark territories in Europe. Through the EGN European Geoparks share information and expertises on a range of subjects including heritage management, sustainable tourism development and environmental education. Balancing tourism and conservation will be one of the themes at next years meeting with the Burren and Cliffs of Moher Geopark sharing the learning from their GeoparkLIFE tourism for conservation project. Delegates to the meeting will get a chance to explore some of the works first hand on a field trip to key project locations.